Management of Turner Syndrome in India Using Anthropometric Assessment of Response to Hormone Replacement Therapy. Sehgal R. and Singh A. 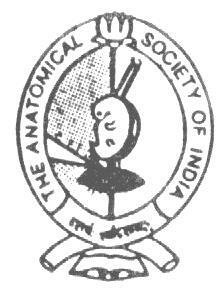 Department of Anatomy, Maulana Azad Medical College and Associated Lok Nayak, G.B. Pant & G.N.E.C. Hospitals, New Delhi ? 110 002 INDIA. Efficacy of Manual Bladder Expression in Relieving Urine Retention After Traumatic Paraplegia In Experimental Animals. Preeths, T.S., Sankar, V. Muthusamy, R. Department of Anatomy, Dr. A. Lakshmanasamy Mudaliar Postgraduate Institute of Basic Medical Sciences, University of Madras, Taramani Campus, Chennai 600 113, India. Jain, S.K. *Pandey, S.N. *Srivastava, R.K. Ghosh, S.K. Department of Anatomy, D.R.P.G. Medical College, Kangra at Tanda. * Department of Anatomy, G.S.V. Medical College, Kanpur. * Bhargava, R., Chandra, N., Naresh, M., *Sakhuja S. * Department of Anatomy, M.L.N. Medical College, Allahabad * Lady Hardinge Medical College, N. Delhi, India. Sud, M.; Sharma A. Department of Anatomy, Christian Medical College, Ludhiana. Punjab INDIA. Abstract : It was a study on prenatal development of parotid gland on 21 dead human fetuses of different age groups. It was compared with adult parotid in dissection on human cadavers. The results showed that parotid gland in early stages was closely related to 9th, 10th & 11th cranial nerves as the mastoid process was absent. The facial nerve was also very superficial as the styloid process was absent. In the adults these nerves were well protected by mastoid and styloid processes. Gray�fs anatomy describes that these processes develop only second year after birth. Histologically in early stages the gland was seen in the form of cords. In later stages acini were formed and still in the late stages the connective tissue, vessels and nerves were associated with the gland as in the adult. Keywords : Parotid gland, development, histology, ontogeny. The parotid gland was studied by many scholars. Some of them are mentioned here. Medial prolongation of parotid was noticed by Thorek (1962). Its development from ectoderm of mouth was seen by Moor (1974). Opening of parotid duct in the vestibule of the mouth was noticed by Hains and Mohiuddin (1972). The capsule of the parotid gland was described by Conley (1975) while Sanchez (1960) described the attachment of the capsule to zygomatic arch and stylomandibular ligament. Warwicks and Williams (1973) described the development of internal jugular vein in the tissue of the neck. They also described the duct system of the parotid gland. Patten (1986) described the development of intimate relation of facial nerve, retromandibular vein and maxillary artery in retromandibular fossa. Paul (1985) discovered the parotid gland covering the carotid sheath and noticed stylopharyngeus in the same plane as the carotid sheath. He noticed the intimacy of 9th, 10th and 11th cranial nerves leaving the jugular foramen along with internal jugular vein. The innervation of the parotid gland was described by various methods by Reihiert (1934), Kuntz (1946), Genis-galvez (1966). Langman (1976) mentioned that glossopharyngeal nerve which is a nerve of third arch, supplies the parotid gland. Patten (1986) described the sterno-cleidomastoid muscle and accessory nerve supplying it. He described the muscle developing from the occipital somites as well as from upper five segments of spinal cord in the developmental stage. Snell (1973) described the superficial, Middle and deep lobes as well as pterygoid process of the gland. Dupliessis (1975) said that the gland has superficial and sub facial planes and stated that enucleation of the gland was possible without damaging the facial nerve. Wang et al (1985) operated on 422 patients with partoid tumor. Nawal and Gamal (1973) worked on parotid of camel and mentioned the similarity of the camel parotid with that of the human beings. Recently in 1990 Suk Keun Lee et al studied prenatal development of human parotid and classified early stage as 10-18 weeks, intermediate stage as 19-24 weeks and late stage as 25-40 weeks. Riva and Testa (1973) described the seromucous structure of the human parotid gland. Balinsky (1970) described development of parotid gland in Mice embryos. Finerty and Cowdry (1962) found mucous demilunes around bases of secretory cells of parotid acini and ducts while Greep, (1966) described the goblet cells in the ducts and increased vascularity of the gland during the secretory phase. Davson and Segalin, (1976) discovered the nuclei of glossopharyngeal nerve related to salivary nuclei and said relay of parasympathetic with sympathetic preganglionic fibres occurs there and post ganglionic fibres go to superior cervical ganglion, follow the external carotid artery and supply the gland. Bloom (1969) found plexus of nerves around the blood vessels and from there the nerve fibers were penetrating the glandular cells. Bhasker (1976) described the sheath of schwann surrounding myoepithelial cells and saw the variation of secretion and said that the final action was on the potentiality of the cell membrane of the cells lining the acini of the gland. The parotid region was studied on 21 spontaneously aborted foetuses. The reason for abortion was on medical grounds. Mothers either had some disease or the other such as hypertension. This had an advantage as the exact prenatal age of the foetus was known. It also was noticed that there were no congenital anomalies in them. These foetuses were obtained from government maternity hospital in Hyderabad and studied there as well as in K.A.A.U. jeddah. The twenty one foetuses were divided into three stages of development of parotid gland. In the first stage seven foetuses were studied from 9th week to 13th week. In the second stage seven foetuses were studied from 14th week to 19th week. In the third stage seven foetuses were studied from 20th to 40th week. In this group some of the foetuses were obtained as intrauterine death for some reason or the other. These foetuses were injected with 5% formalin through umblical vein immediately after delivery. These were kept in 10% formalin. The parotid was dissected and the tissue was fixed in neutral buffered formalin and later processed for section cutting. Five micron sections were taken which were stained with the following Masson�fs Trichrome stain. I. The section was brought to water by the following method. (a)	Make a solution of 1% ponceau-fuchsin in acetic acid. (b)	1% phosphomolybdic acid in distilled water. (c)	2.5% aniline blue (water soluble) in 2.5% acetic acid. Mix a, b & c in equal quantity. Put the slide in the above solution for 20 minutes. II. Staining was done by the following procedure. 1. Cover the slide with lugol�fs Iodine for 5 minutes. 2. Decolourize with 5% sodium thiosulphate. Wash well in water. 3. Stain with weigert�fs haematoxylin for 20 minutes. 4. Decolorise with 1% alcohol for twenty seconds. 5. Wash and blue in tap water. 6. Stain with ponceau-fuchsin solution for 5 minutes. 7. Quickly rinse in distilled water. 8. Mordant in phosphomolybdic acid for 5 minutes. 9. Drain the slide and stain with Aniline blue for 5 minutes. 10. Put 1% acetic acid to remove excess blue. 11. Rinse in 95% alcohol. 12. Dehydrate in absolute alcohol. After staining these were microphotographed with magnification of 25x 16 �L 0.6 and 40x 16x 0.75. Third Stage : The gland was seen to extend over the lower part of the face. The duct was well formed. The facial nerve and carotid sheath were seen very superficially. Histologically it showed well formed lobes and inter lobular ducts. At the opening of the main duct, the mucous membrane was in concentric circles, as if forming a sphinchter. (fig. 3 A, B&C). It is clearly visible from the dissection that parotid is extending in the form of a rod from the mouth towards the ear. Histologically, it is seen as if developing from the ectoderm of the mouth i.e. in the area of developing mandible from 1st arch. Hence we can say that the parotid is developing from 1st pharyngeal arch. During the second stage it is surrounded by the mesenchyme and in the third stage it is going till the neck. The nerve supply to the gland although not seen in this study, it is known from literature that glossopharyngeal nerve supplies it. It is the nerve of third arch. From the present study it is seen that the gland is closely related to the facial as well as the vagus nerves. These are the nerves of second and fourth pharyngeal arches respectively. of radius and radial component of thumb. Fig. 2 : X-Ray photograph - showing anomalies of the forearm skeletal tissue and hand. Fig. 3 : X-RAy photograph - showing polydactylism of single phalanx on the radial side. It is concluded that the parotid may be a derivative of the 1st, 2nd, 3rd and 4th pharyngeal arches. This can further be taken as a research subject in future investigations. 1. Balinsky, B.I. : An introduction to Embryology. W.B. Saunders Company, Philadelphia, pp. 573-574 (1970). 2. Bhasker, S.N. : Organ�fs orgal Histology and Embryology. C.V. Mosby Company, 8th ed., pp. 328-357 (1976). 3. Bloom, W.: Fawcett, D.W. : A textbook of Histology. W.B. Saunders Company, pp. 518 (1969). 4. Con, H.J. : Marry, A.D. : Victor, M.E. Masson�fs trichrome stain Orginally described by Massoon in 1929. Biological Stain Commission. 6. Davson, H. : Segalin, M.B. : Introduction to physiology, Academic Press, London. pp. 317-318 (1976). 7. Duplessis, D.J. (1975) : A synopsis of Surgical Anatomy. 11th ed. Briston, John Wright and Sons Ltd.
9. Finerty, J.C.; Cowdry, V.E. ; A text book of histology. Lea and Febiger, Philadelphia, pp. 366-370 (1962). 10. Genis-Galvez, J.M., Santos-Gutierrez, L; Martin-Lopez, M., (1966) : On the double innervation of the parotid gland. Acta Anatomica., 63 : 398-403. 11. Greep, O.R. : Histology, 2nd ed. McGraw-Hill Book Company, London pp. 460-462 (1966). 13. Kuntz, A. and Richins, C.A. (1946) : Journal of Comparative Neurology 85: 21. 14. Laing, M.R. and McKerrow, W.S. (1988) : British Journal of Surgery pp. 310-312. 15. Langman, J. (1976) : Medical Embryology. 3rd ed., Baltimore, Maryland. Williams and Wilkins Co., U.S.A., p. 340. 17. Nawal, S.M.A. & Gamal E.D.K. :�f�f Morphological, micromorphological and histochemical studies on parotid salivary gland of one humped camel. �gGegenbarus-Morphol.Jahrah. (1975). 19. Paul, M.A. (1985) : On surgery beneath the parotid gland. Pharyngeal branch of the vagus and the carotid sheaths. Ceylon Medical Journal 30 (10) : 7-12. 21. Reihert, F.L. (1934) : Architectural Neurol Psychiat., 23 : 1030, Chicago. 22. Riva, A.; Testa, F, (1973) : Fine structure of acinar cells of human parotid gland. Anatomical Record 176: 149-165. 23. Sanchez-Montesinos, I. (1960) : Development of the parotid gland. II. Organization of the capsule. Europian Arch.Biological. 24. Snell, R.S. (1973) : Clinical Anatomy for Medical students. Little Brown and co., Boston, U.S.A. pp. 647-650. 25. Suk-Keum Lee; Lim, C.Y. ; Chi, JG. ; Yamad, K.; Hashimura, K.; Kunikata, M.; Mori, M. (1990): Prenatal development of human major salivary gland and immunohistochemical detection of keratins using monoclonal antibodies. Acta Histochemistry 89:213-235. 27. Wang, D.L. Song, J.L.D.S., Donoff, R.B.M.D. and Gurelneck, W.D., M.D. (1985): A modified centripetal approach to parotidectomy. Journal of Oral & Maxillo facial Surgery: 43: 14-19.